Model Denise1.69 m, wears size S.
Limited collection! The retro 60s Margerite Sweetie Halter Dress by Heartbreaker Fashion has been with Heartbreaker since day 1. We've never had to phase it out of the line for a number of reasons - it fits, it's classic, and people just love it. We love it too. This halter dress features the oh-so classic sweetheart neckline, full swingin' skirt, and princess seems through the body for a versatile fit. This dress looks wonderful on every kind of figure! 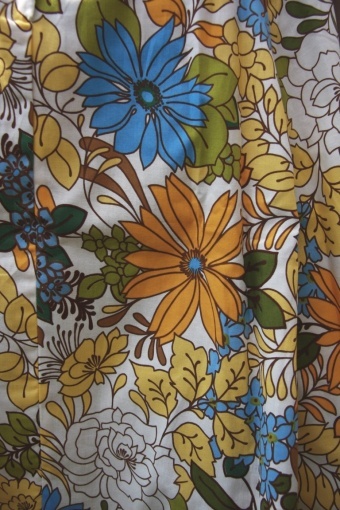 The fabric is yellow and blue flowers with hints of brown and green leaves. It screams SUMMER! Zipper in the center back, elastic to hug the body, and small ties to make for a lovely fit. Made of 100% quality cotton, made in USA. Denise wears our Noë pumps.